I am half-way through my experience here on the Galapagos Islands an enjoying every moment. I can’t believe how much has been packed into just a few days. I have done so much and experienced so many different things that if feels like I have been exploring for weeks already. My good friends at Gecko’s Adventures are certainly coming through again. I found internet as we board at port for the evening in Puerto Ayora and like an addict diving into his drug at first chance I am memorized by the net. I will be back on solid land again on the 17th of November and will be sure to share my adventures with you as soon as I do. For now, enjoy this photo of the week. The island is as barren as anything I have ever seen so closely adjacent to the sea. It houses cactus, dry shrub bush, and a soil so arid it bursts in balls of dust when I step to shallow. Yet signs of the sea are everywhere. Most of the rocks are moulded smoothly from their days among the waves. Some of the rocks are not rocks at all but pieces of ancient coral that was once the home to the multitude of fish swimming through the cold currents. 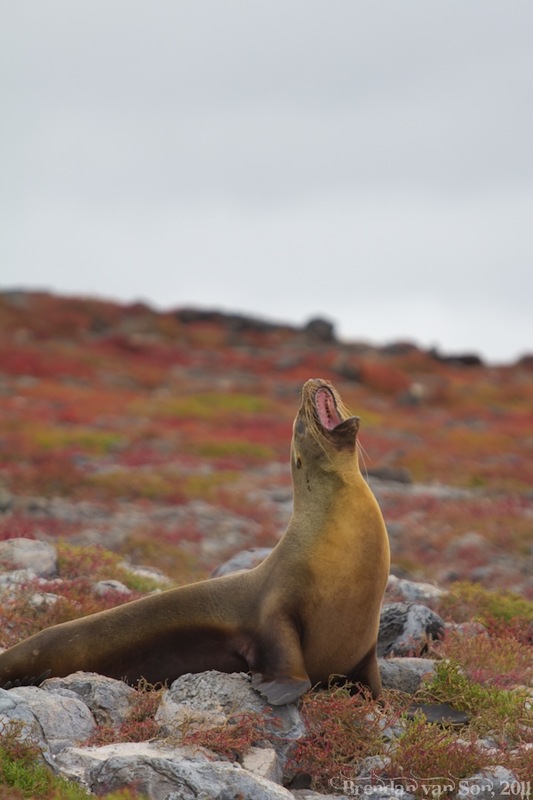 At times, among the brightly coloured shrubs a sea lion lays sleeping. Perhaps he or she has climbed up here to escape the grasps of an enemy, perhaps they just wanted to be alone, or maybe, like me, they have come up here to escape their natural confines and explore. Still, regardless how far from home the sea lion calls out to its nearby family member, obviously never oblivious the distance it feels from home. Great photo. Can’t wait to hear more about your time in the Galapagos. Great photo! I cannot wait to see a sea lion up close. It looks like it’s howling at the moon! Haha, it may well have been. That was a full moon day! Look forward to more adventures and pictures from the Galapagos Islands. This is a great shot – starting to think sea lions are photographic naturals, they’re always doing something great for the camera!